Just 3 days after the spinal tumors were detected, Linnea and I were in a hospital and preparing for the radiation. An MRI and CT were made, the following day the CT was repeated in situ, in other words when Linnea was in the radiation machine. 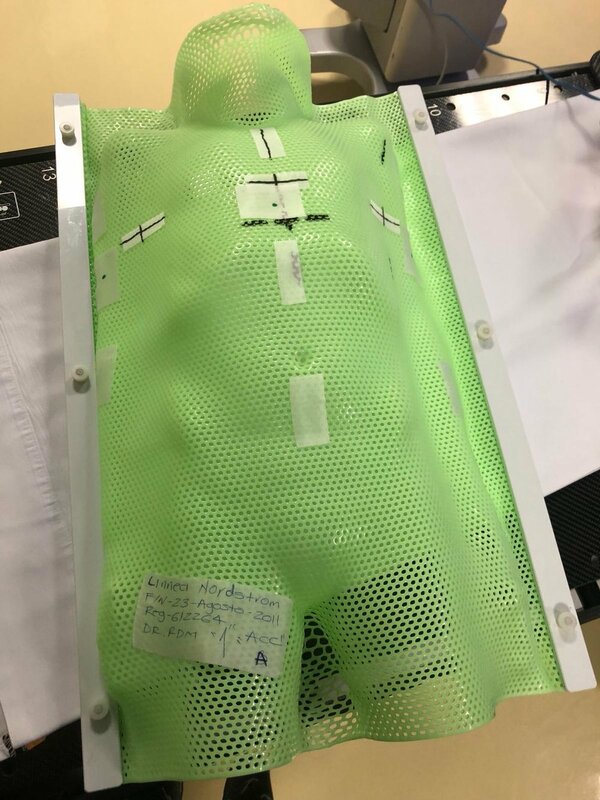 A fixation device was made for her, a casting of her torso that is applied every time she receives radiation to ensure that Linnea is in exactly the same position. I call it for the knight armour and it hurts my heart every time I see how hers is so small compared to others belonging to adults. Right now, Linnea will have radiation 15 times, after which a new PET scan with methionine 11 will be made to assess the effect, and after that, doctors here will determine how many radiation sessions more are needed. We are so grateful that the radiation could be arranged so fast. Our doctors in Sweden were also prepared to get started as quickly as possible, but it would take more weeks and the intraarterial chemotherapy would have had to be postponed, and we want to avoid that at all costs. Now Linnea and I go to the hospital every morning. Before that, Linnea chooses which of her stuffed animals that is going to accompany her for the day. Then we enter the hall where the radiation machine is located. The machine is actually Swedish, "Versa HD" manufactured by Elekta, so I'm joking with the staff and saying it feels like home sweet home. After that Linnea is sedated, her armor is laid on her and she is radiated. Everything goes very fast and Linnea says "Bye" to all the staff. The first time I was scared by the radiation, but this time it does not feel as scary. Right now, I am reading Marie Curie's biography and she has said "Nothing in life is to be feared, it is only to be understood. Now is the time to understand more, so we may fear less." This time I know more, I do not feel so scared. So Marie Curie was right. Again. After the radiation we do something with Linnea: the arcade, the toy store, the trampoline park. What makes us a little bit calmer now is that she is really good, has energy, shows no symptoms. Yesterday the radiologist wondered how Linnea is after treatment. Radiologist: - Does she have a headache? Is she tired? I: - Oh no. Yesterday we were in the trampoline park where she jumped for an hour. All the staff in the room laughed, it's so nice she likes to do things that other six-year-olds love. It was a shocking message that she had to be radiated, that she and I have to stay in Monterrey for maybe 5 weeks instead of 1 week, to miss her brother's birthday, to miss the talent show at her school, that she's not together with her classmates to learn the numbers 8,9 and 10. But our closest goal now is to see her on her first graduation from school in a white dress, and to make sure she starts first class come fall. And by the way, another tooth is loose!